Big thnags poppin for The $tatus Faction this weekend. 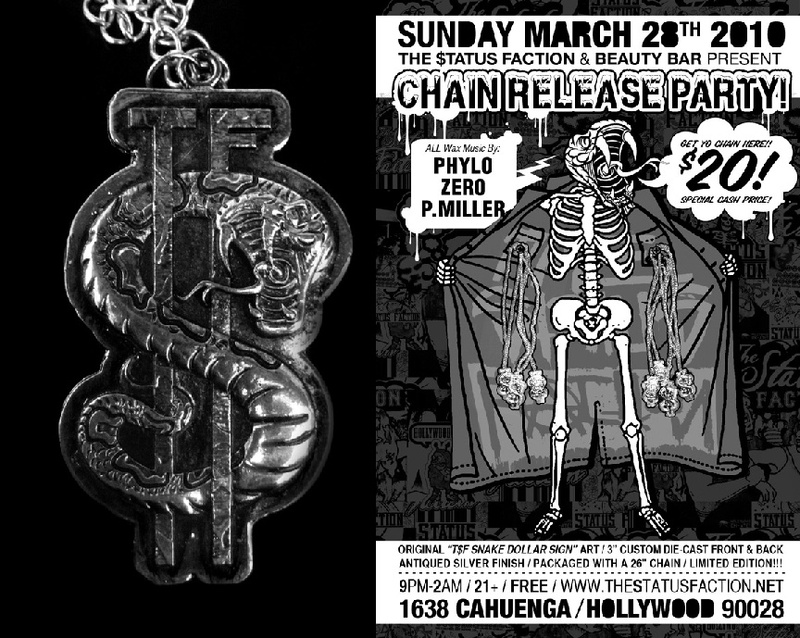 We’ll be doing live art in Burbank at The California Institute of Abnormal Arts on Saturday, then our new T$F “Chain Release Party” at Hollywood’s own Beauty Bar on Sunday. Come hang, get crunk, see some fresh work, puke, pass out, and repeat. OPEN BAR – tons of booze! Come celebrate the release of the first piece of T$F jewelry. • Original The $tatus Faction “Snake Dollar-Sign” artwork. • Custom die-cast molded front AND back. • Solid metal, 3″ tall, heavy as heck, antiqued silver finish. • Comes individually packaged with a 26″ chain. Can’t front on this price point- it’s a recession ya’ll!! The Beauty Bar • 21+ / 7pm-2am / FREE! p.s. 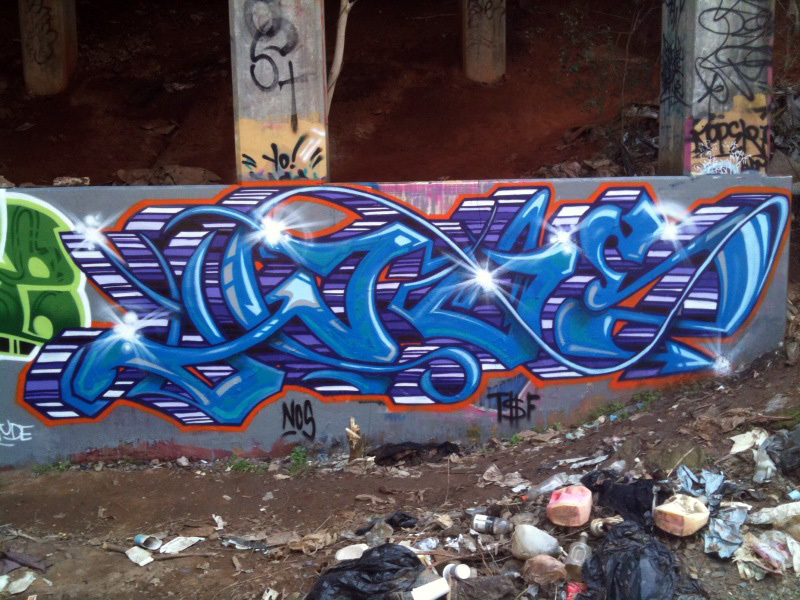 Nasty NOS- is giving Atlanta a break to destroy with the L.A. family. Lucky for you left in Georgia. Take 5 this weekend. This entry was posted on March 24, 2010 by The Status Faction. 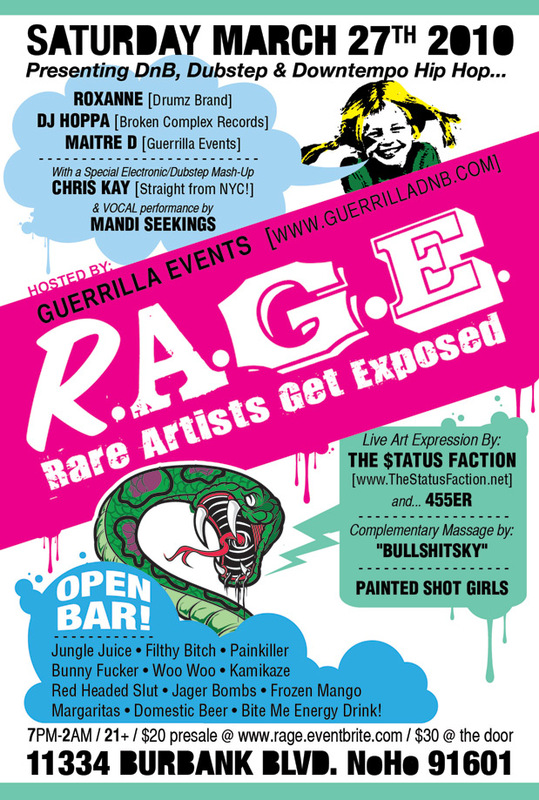 It was filed under Uncategorized and was tagged with Beauty Bar, Burbank, California Institute of Abnormal Arts, events, hollywood, jewelry, L.A., Live Art, Los Angeles, Parties, R.A.G.E., T$F, The Status Faction, tsf.